YardEdge’s new guest blogger, Petrine Archer-Straw is profiling some of the up and coming young artists to watch on the local scene. Phillip Thomas currently lives and studies in New York but continues to exhibit in Jamaica. In 2008, he won the Aaron Matalon Award at the Jamaica National Biennial for his two outstanding paintings. 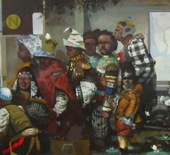 In one, The N Train (2008) his black subjects, huddle together as they make their way home. Like actors in an urban travesty they are depicted as medieval monsters, deformed, costumed, and burdened with the trappings of daily life. With stylized imagery that borders on characature, Thomas raises questions about race and identity and makes surreal judgments about the state of post-modern blackness today.